Have you ever placed something in your cart while shopping online but never actually made the purchase, only to receive an email shortly afterward that asks if you’re still deciding on it? That’s remarketing. We’ve built that feature into our contribution forms, so your campaign or organization can follow up with visitors who landed on your form but didn’t actually complete their contribution. It’s a way to increase conversion rates and get the most out of each and every ask by bringing in more dollars without putting in much extra work. 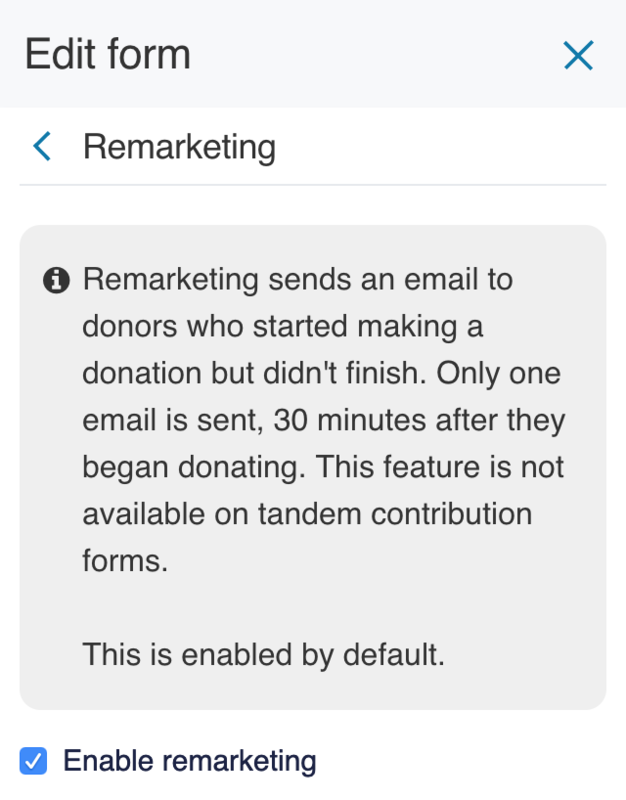 Here’s how it works: Donors who abandon your form before completing it will automatically receive an email thirty minutes following their incomplete donation. What counts as an incomplete donation? A donor selects a contribution amount and fills in their email address, but leaves the page before going on to fill in their credit card info. If that happens, we’ll make sure they get a reminder with a link to your form asking them to complete their contribution. Remarketing is turned on all for all forms — except for Tandem and community forms — by default. If you’d like to turn off this feature, use the form editor. Go to the "Contribution Forms" tab of your Dashboard and click the "Edit" button to the right of your form's name to open the editor. Click the "Edit" button on the form navigation bar (form navbar) to open the form editor. Go to the "Remarketing" tab. 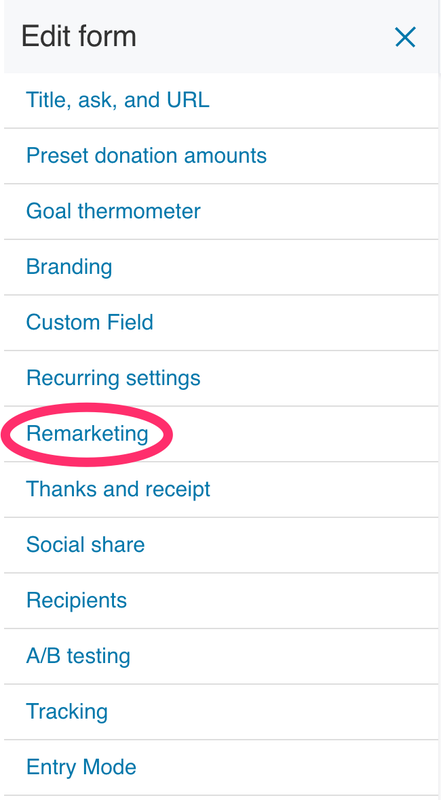 Then uncheck the "Enable remarketing" box and publish your changes. A button with the text "Finish your donation" that links to your contribution form is automatically included in every remarketing email, but we recommend adding your own message that is specific to your cause or campaign. You should view your custom text as a chance to make the case for why it’s so important donors finish the form and complete their donation. Enter your message in the "Remarketing email body" field. Click the green "Publish" button to save your updates. If you have branded receipts enabled, that branding will be included on the remarketing email. An unbranded email won’t include any logo.